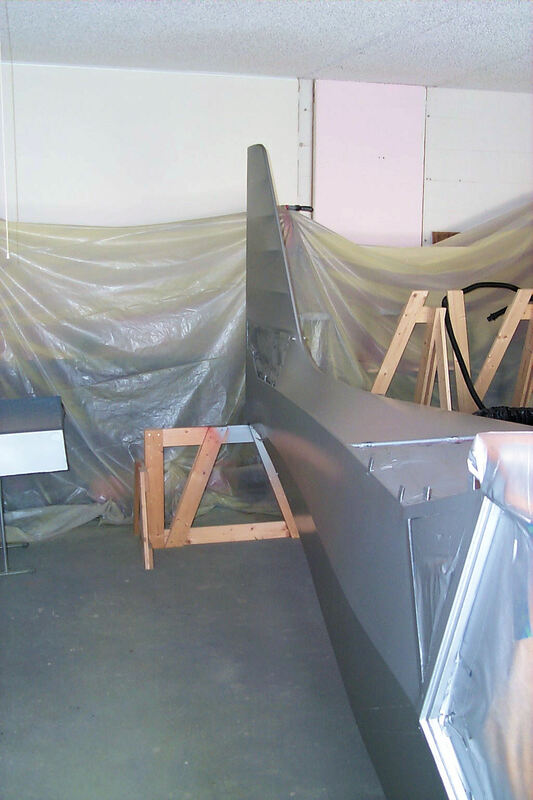 Painting the Fuselage Continued! While it's possible to paint two coats a day. One in the morning and one in the afternoon. 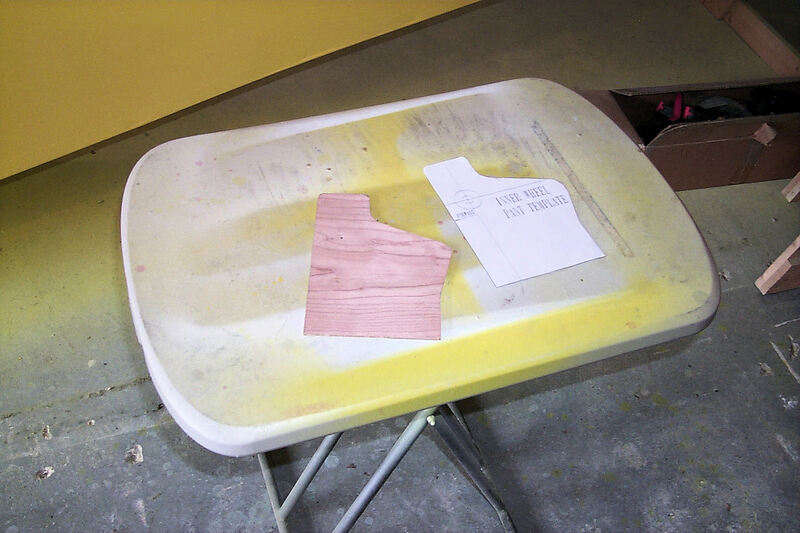 I adhere to the best recommendations of the book and and let each coat cure for 24 hours. Anyway I practice my tuba in the mornings. 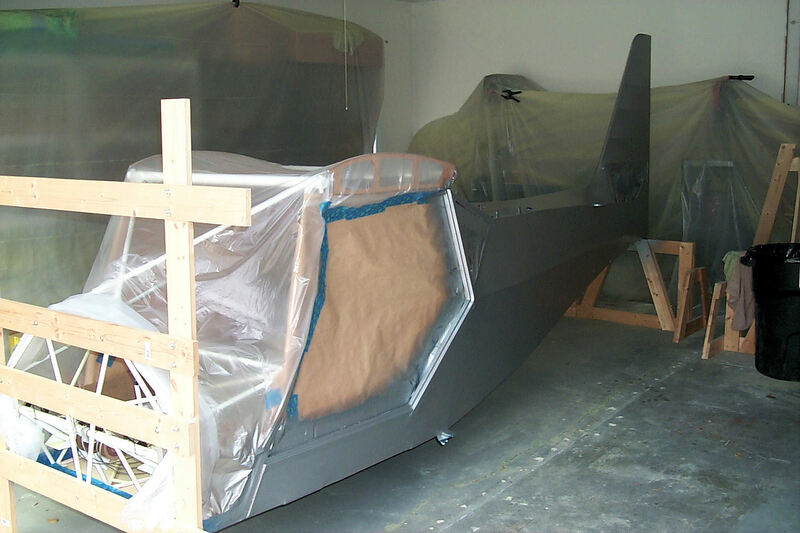 13 May 2013: The fuselage is upright and the first coat of Poly-Spray has been applied. 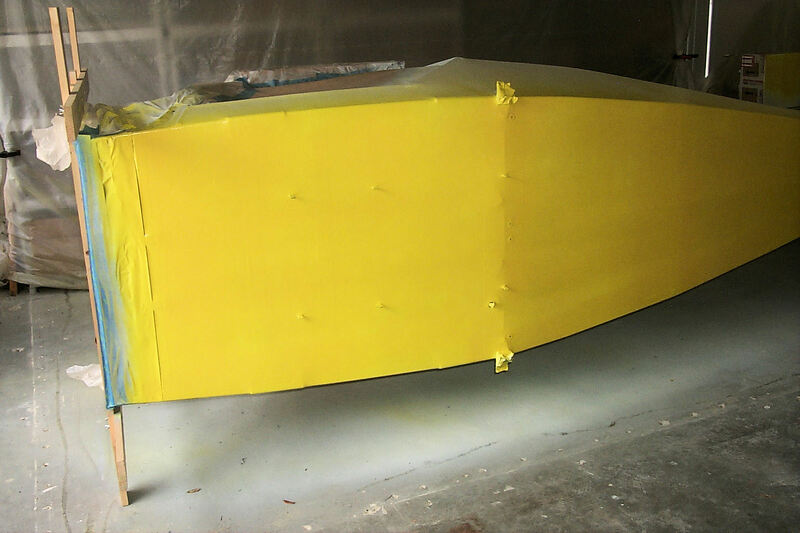 15 May 2013: Second coat. 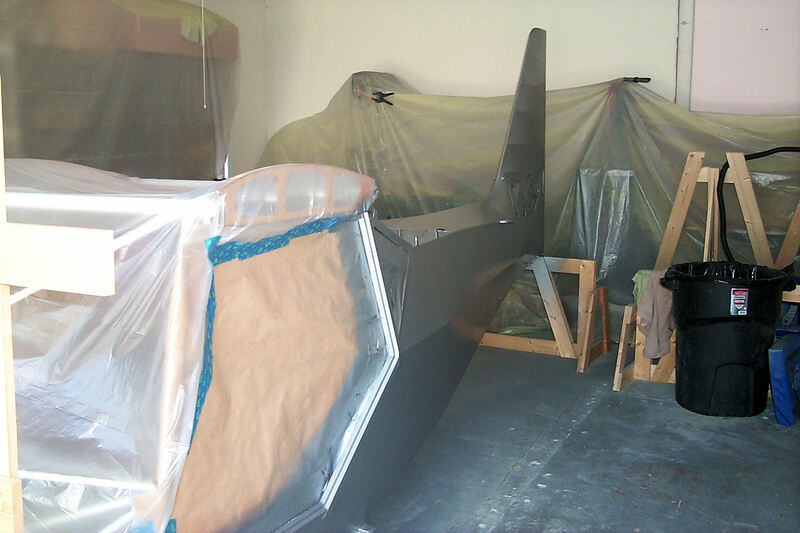 17 May 2013: The final coat of Poly-Spray! 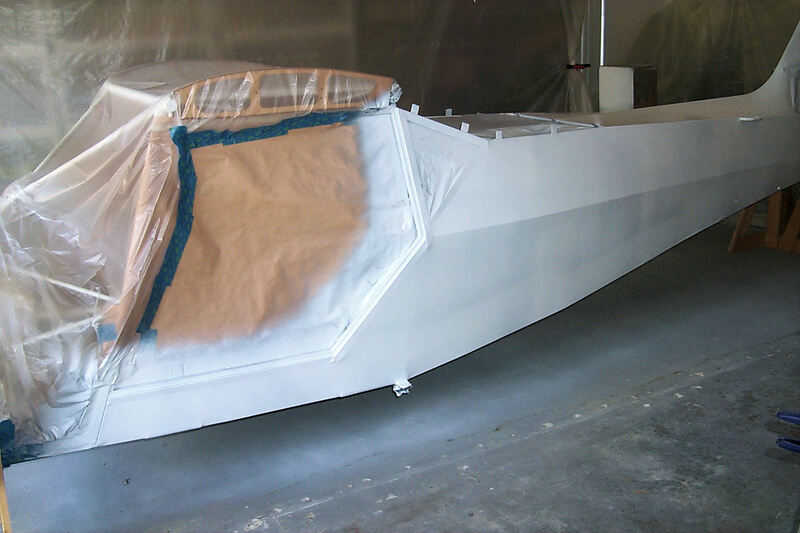 18 May 2013: The first coat of white. 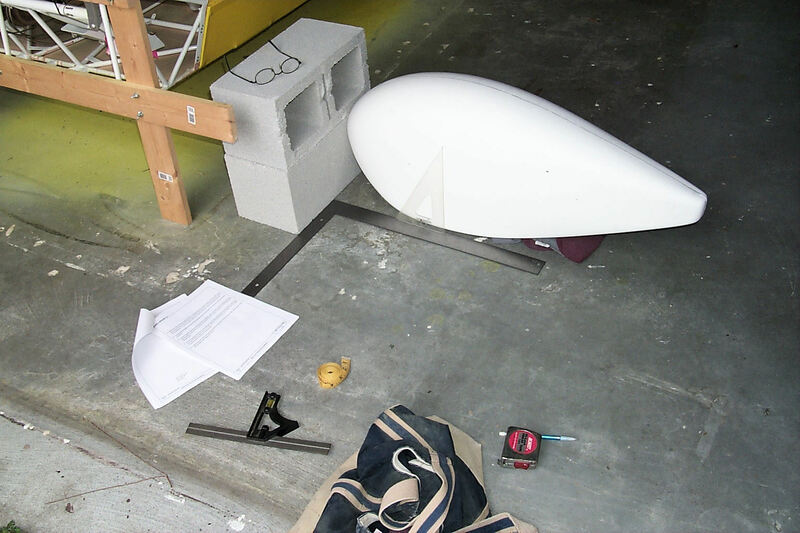 23 May 2013: The Last coat of white. 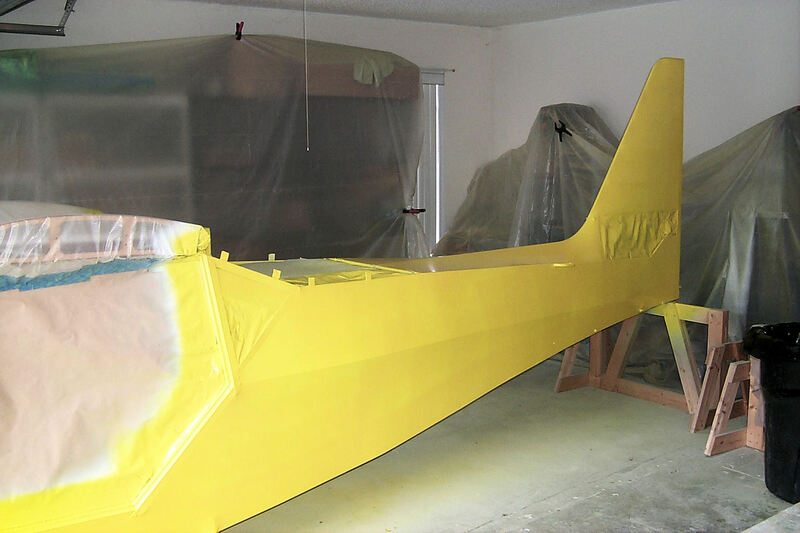 Next, I'll turn the fuselage on its side and apply two coats of white and two coats of yellow to the belly. 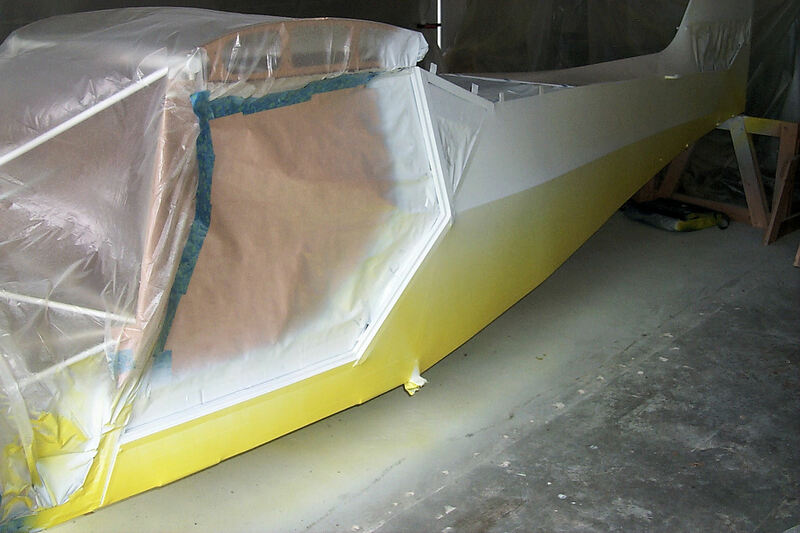 After that all I have to do is turn it upright and finish the topsides with two coats of yellow. 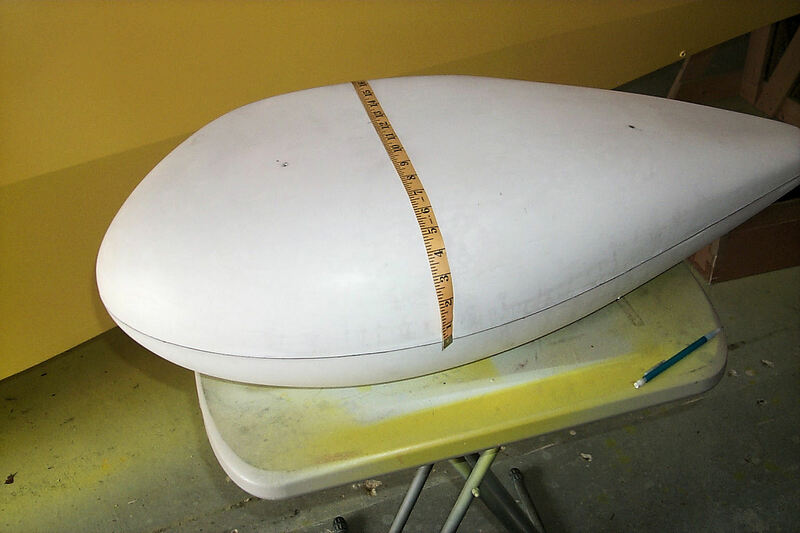 26 May 2013: The belly gets the first coat of white. I'm beginning to see the light at the end of the tunnel. Soon I'll be done with painting for a while and back to doing installations. 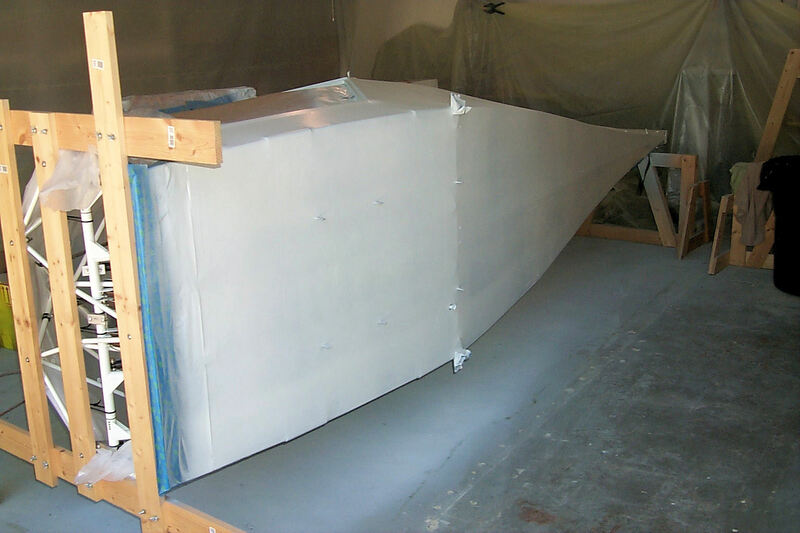 27 May 2013: Last coat of white! 29 May 2013: Yellowbelly! 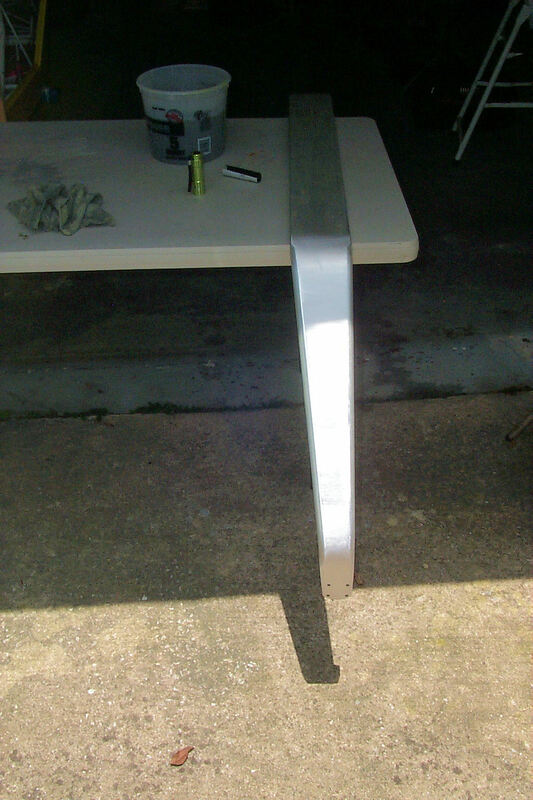 First coat. 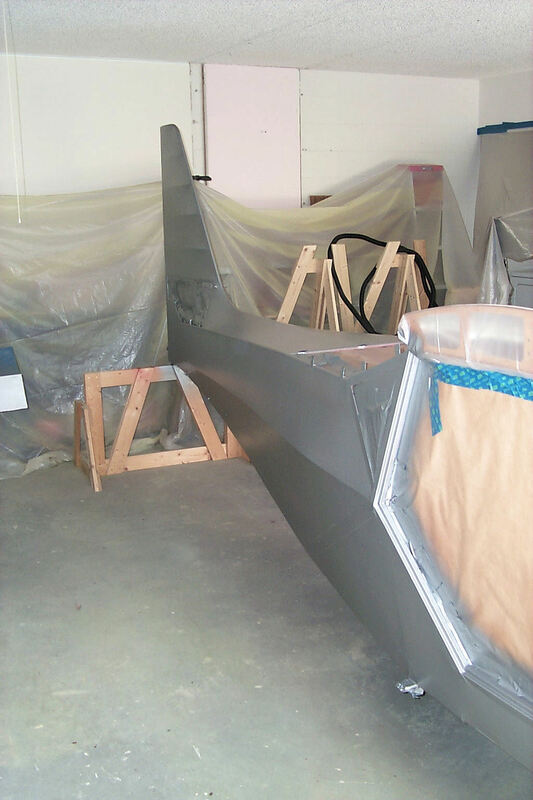 31 May 2013: Yesterday I applied the last coat on the belly and today my brother and me turned the fuselage upright. As you can see I have some overspray on the sides. 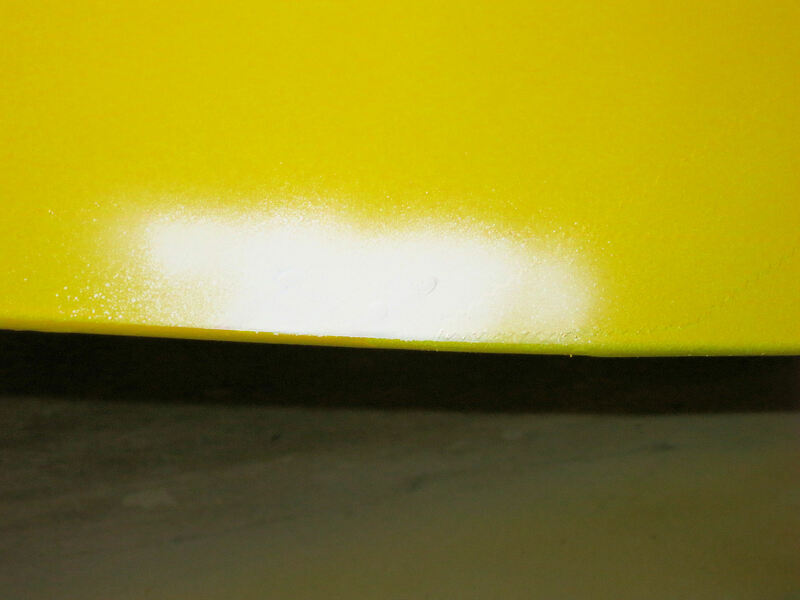 My experience is the next two coats will cause the overspray to melt into the new paint and give me the normal level of gloss. If I'm wrong I'll have extra work to do. 2 June 2013: A Fix: As much as I tried to avoid it there was one place where the belly paint dribbled while the fuselage was on its side. The rain was coming so I could only something quick. I decided to do something about the dribble. First I masked around it with tape and then used a rag with a little MEK to rub it down. This diminished the size of the drip but not completely. I had to stop when the grey Poly-Spray started to show. Knowing that this would show through no matter how many coats of yellow are over it, I used a Pre-Val to spray a little white. 10 June 2013: Last week I was slowed by a tropical storm. Lots of rain kept me from painting. But, at last, I was able to finish the painting and clean the shop. 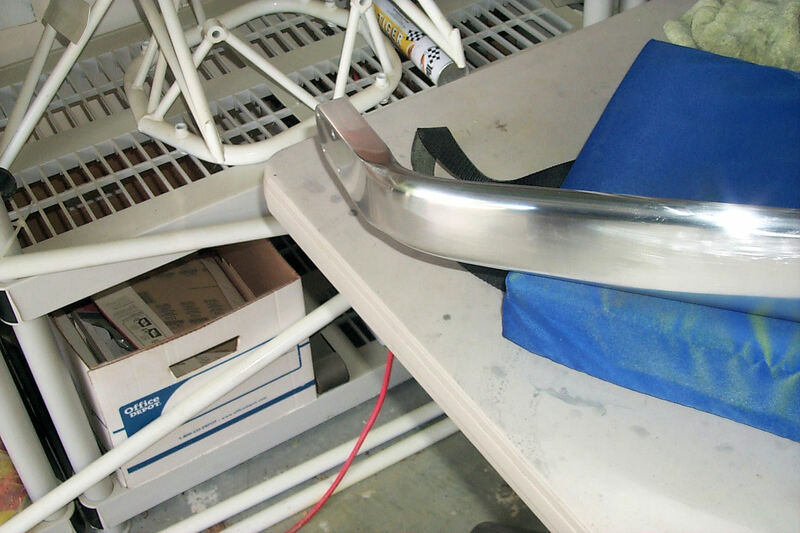 My next project is to get it on its landing gear. 13 June 2013: Polishing the gear legs: I've decided to put a "mirror" finish on the main gear legs. Not only does it look nice but, in my opinion, it's more durable than paint. I've done my research. First wet-sand with 320 grit chord-wise until all marks disappear. 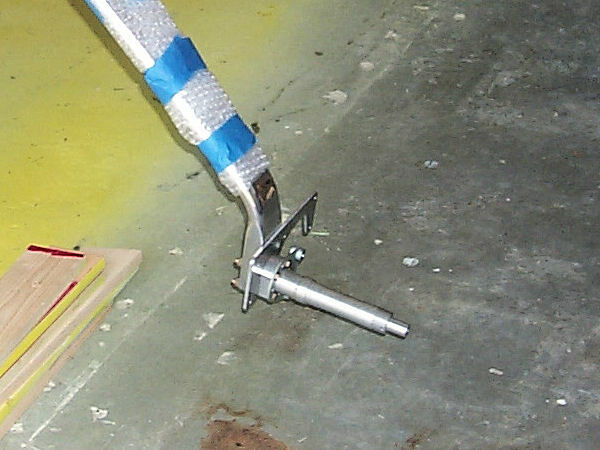 Then wet-sand with 400 grit span-wise until the chord-wise marks disappear. Continue in this manner with successively finer grits until I finish with a fine rubbing compound. Today I worked until my arms gave out and the heat got to me. 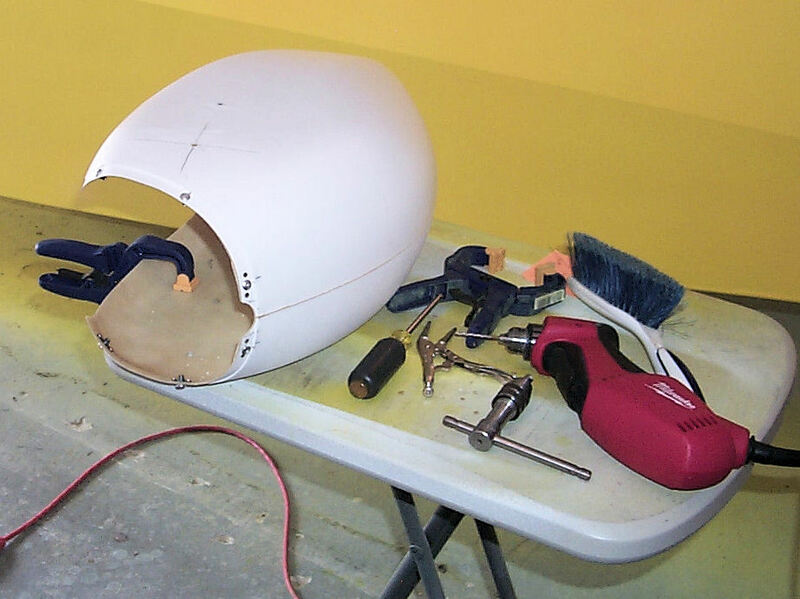 Nobody told me that building an airplane would be such hard work. 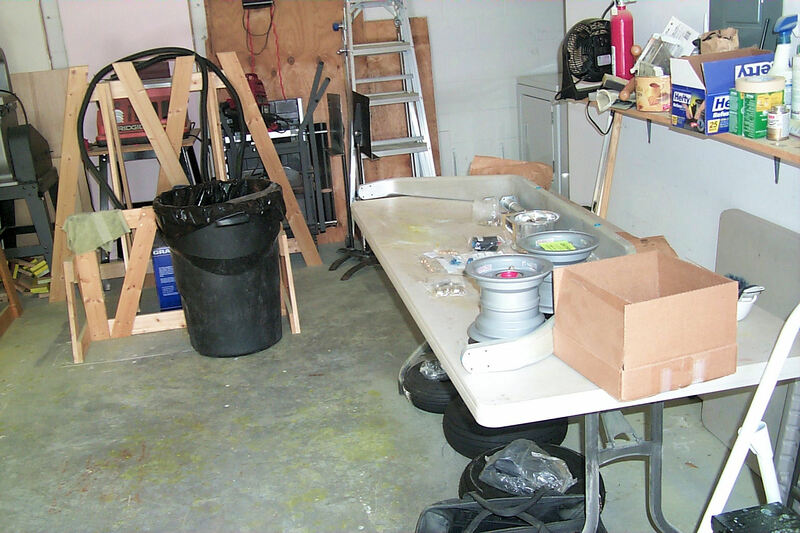 22 June 2013: Work continues! We took off three days to fly the Old Cessna to Key West. 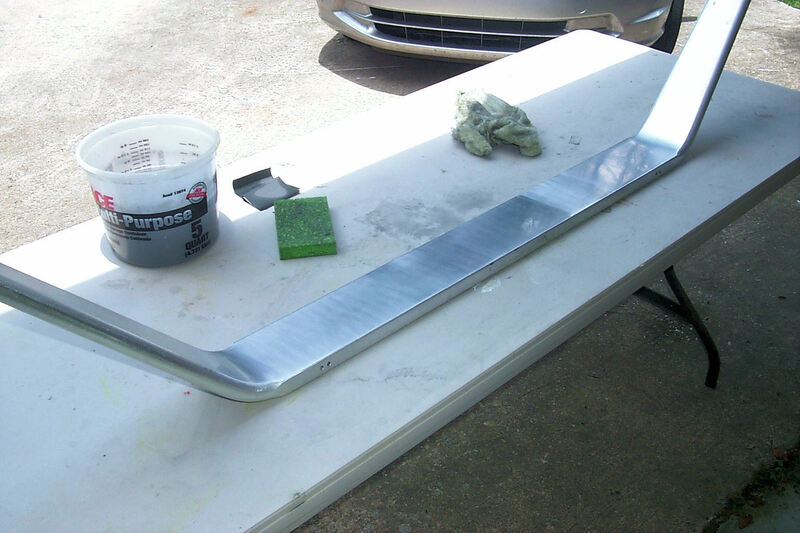 The rest of my time was devoted to wet-sanding. 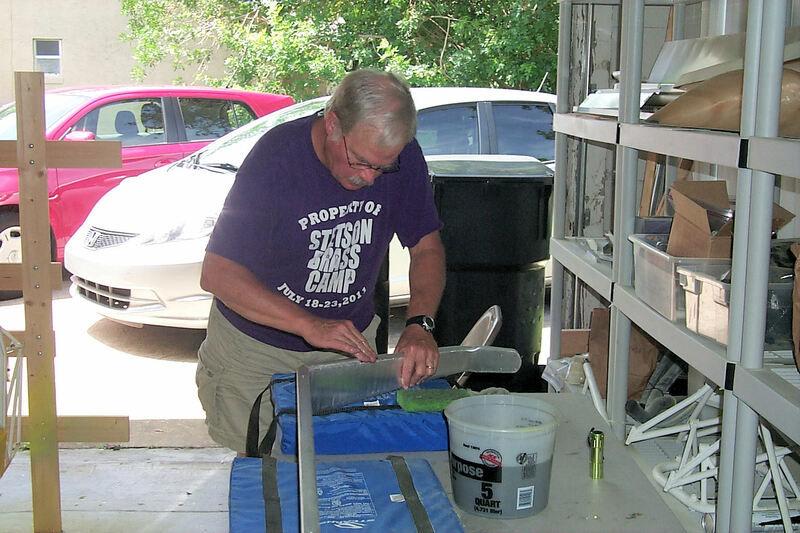 23 June 2013: I keep being told that I need more photos of myself building my kit. As if I could afford paying someone to come to my house to build it for me. Still wet-sanding and the floggings will continue until morale improves. Meanwhile watch this video of our trip to Key West. 27 June 2013: Work continues. I finished rubbing the gear with 320 grit paper and started rubbing with 400 grit. Each time I go to a finer grit I rub 90 degrees to the previous layer. I know that I've rubbed enough when the previous marks disappear. It was nice to discover that this layer is going much quicker. Independence Day 2013! 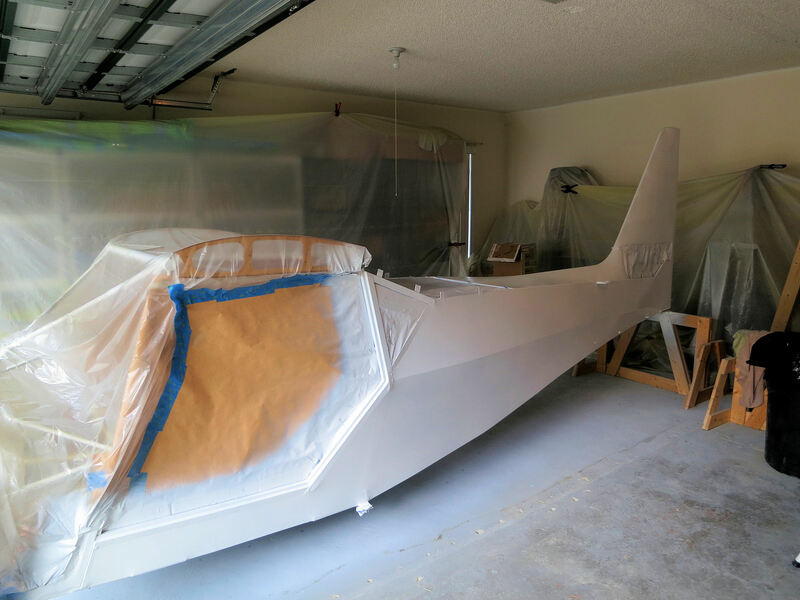 : I've been working polishing the landing gear everyday since my last post and have finally worked down to 1500 grit paper. Only a little of what you see here is polished to this fine grit. There's more to do but, I'm seeing the light at the end of the tunnel. 6 July 2013: Done! 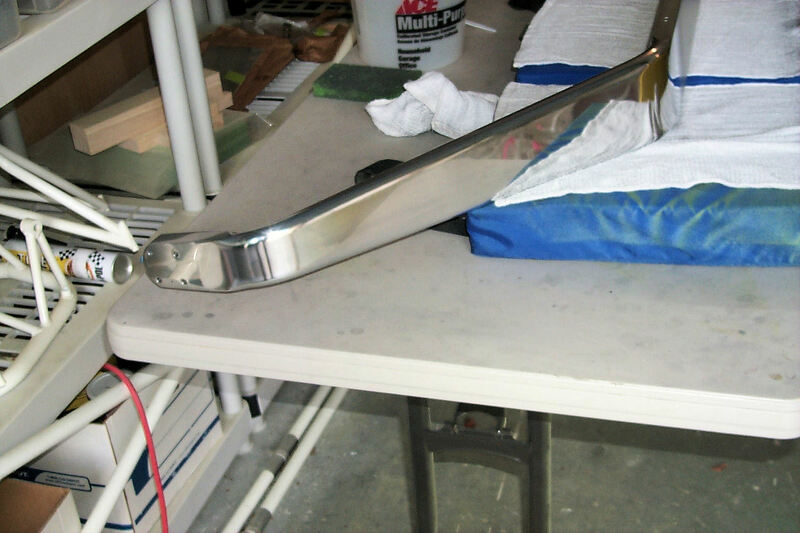 I finished with a commercial metal polish. No power tools. Everything done by hand. My hands hurt. 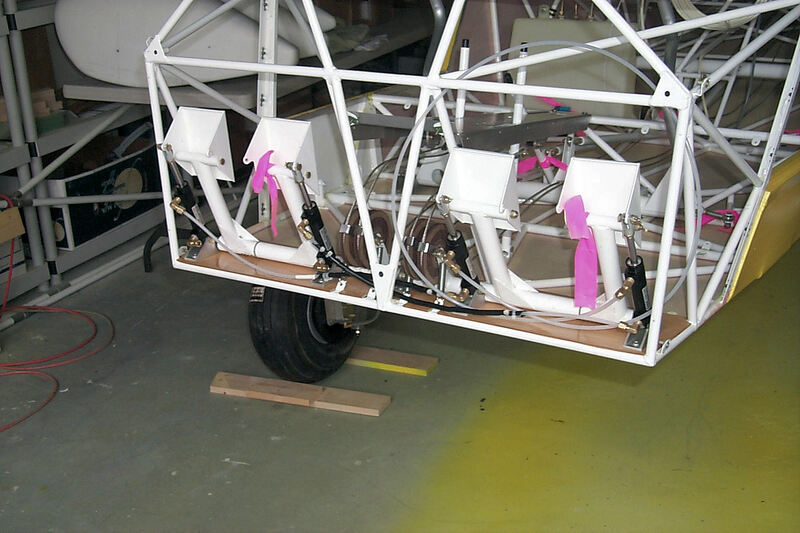 12 July 2013: Fitting the main gear mounting blocks. These are temporarily held in place with hardware store bolts driven from the top. This allows me to remove the bottom block to allow placement of the gear. When this is done I'll reattach the bottom blocks with the proper AN bolts driven from the bottom. This defies convention but, It's the manner recommended in the Builders Manual. 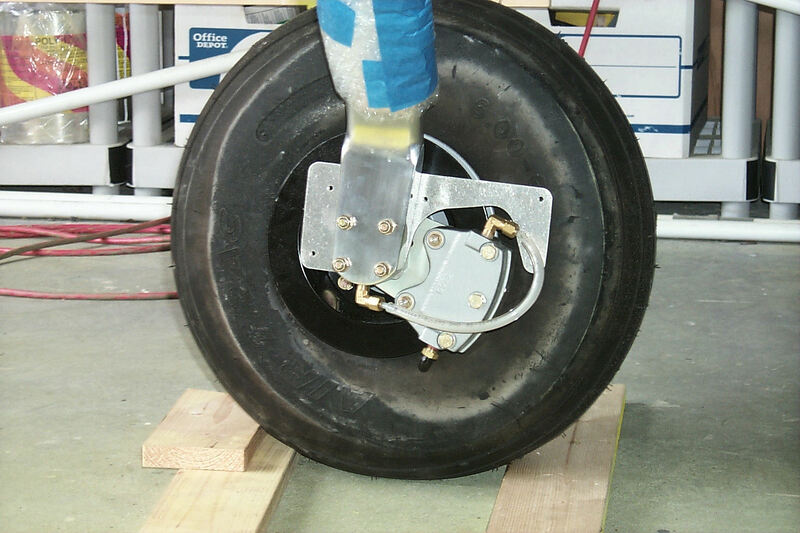 13 July 2013: Wheels! Covered with talc. Starting tomorrow I'll be in DeLand for a week working at the Stetson University Brass Camp. No kit building until I'm back. Happily I was able to assemble the wheels. 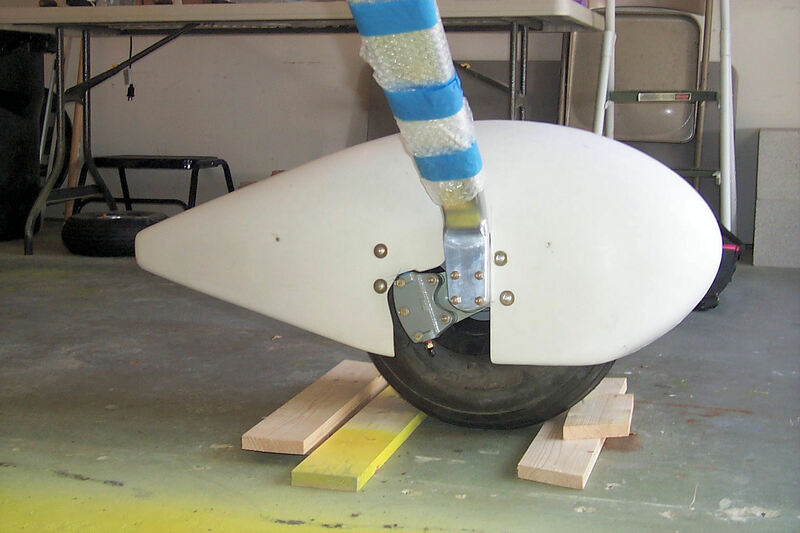 While the nose wheel has sealed bearings the main bearings need to be packed with grease. This will happen when I gather all the materials after the camp. 22 July 2013: I'm Back! The wheel bearings have been packed with grease. 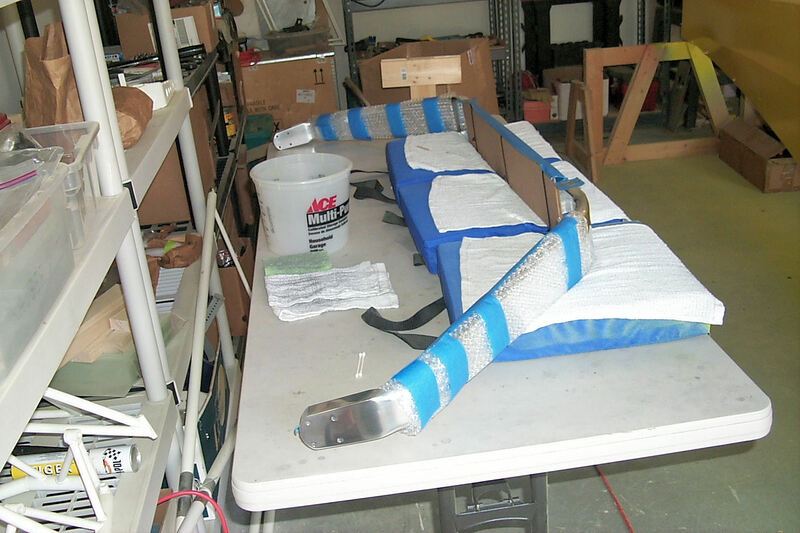 The landing gear has been wrapped in bubble wrap and cardboard. This is to protect the finish while I install it. 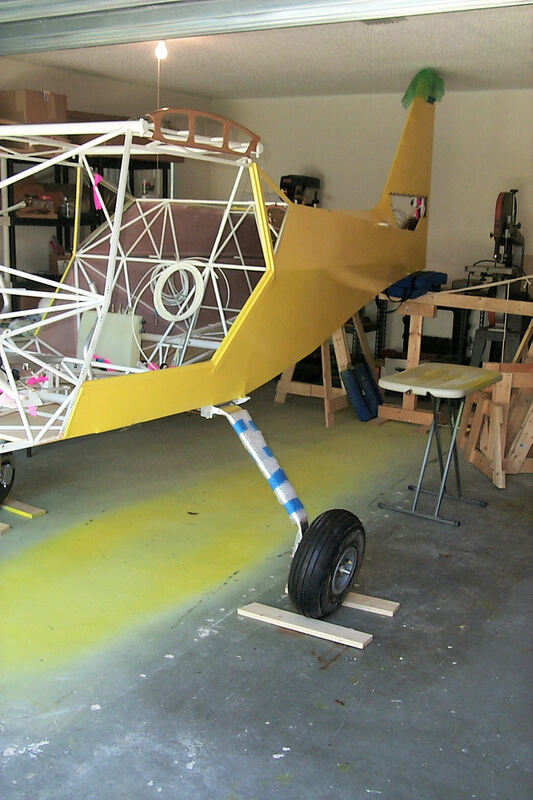 When on its feet the tri gear Kitfox is 8 feet over the ground. My garage ceiling is 8 feet. 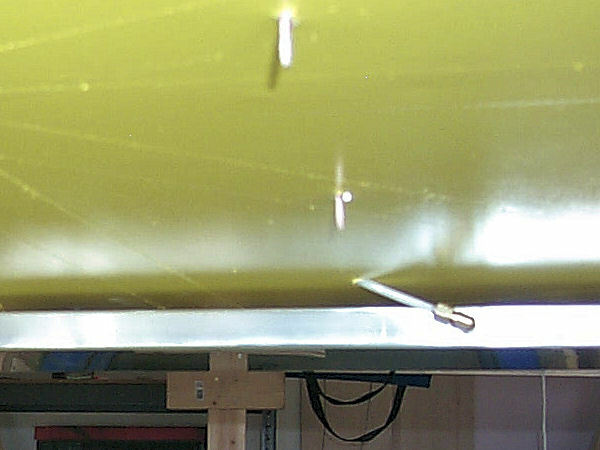 To protect against the inevitable I wrapped the tip of the rudder with bubble wrap. 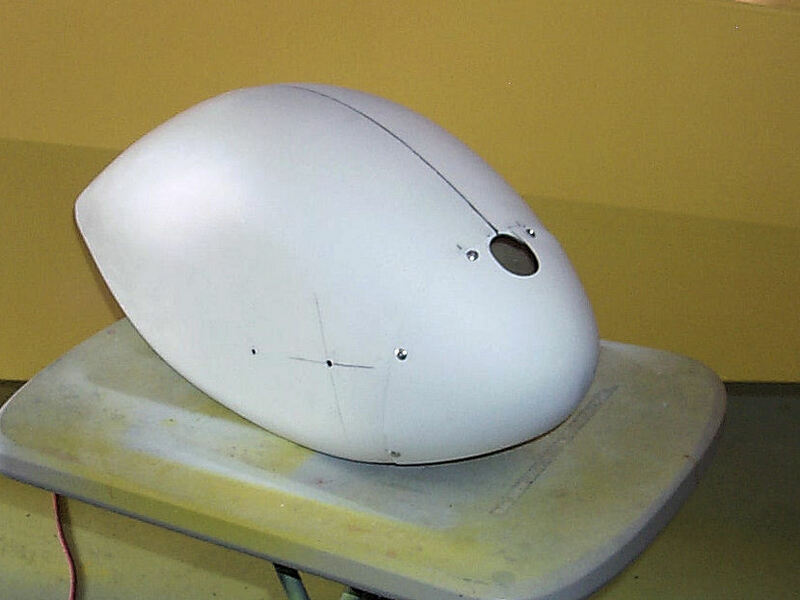 When the nose gear is in place I'll block it in order to lower the tail. 24-25 July 2013: A bit of a screw-up! 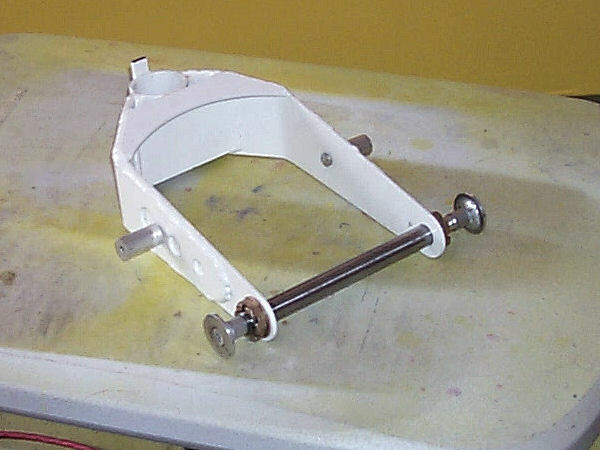 I can't find the roll pins that need to be installed on the landing gear to stabilize its left-right positioning. I know that I once had them because I logged them in my original inventory. But, after days of searching, I can't find them. They are stainless roll pins and not available from the local hardware store. I've ordered new ones and will have to wait until they arrive before mounting the gear. Meanwhile I get busy with other things. 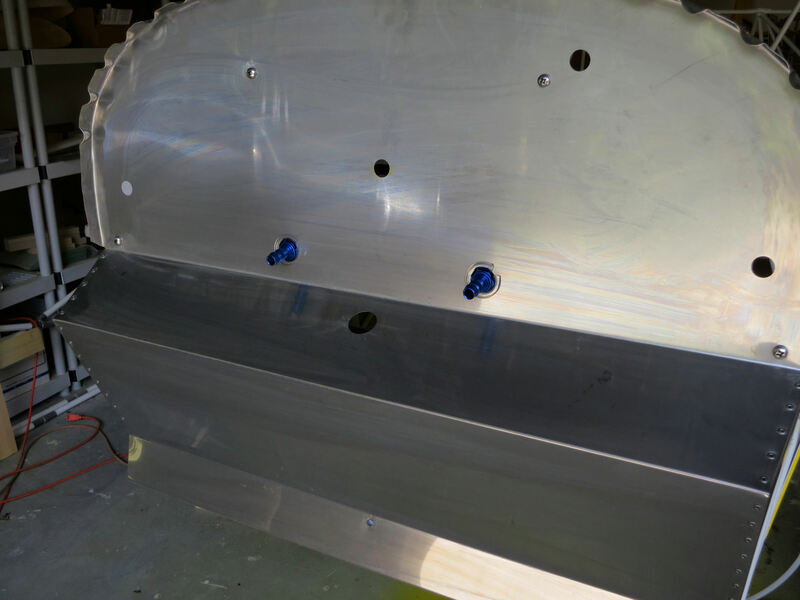 Like the main gear wheel pants. 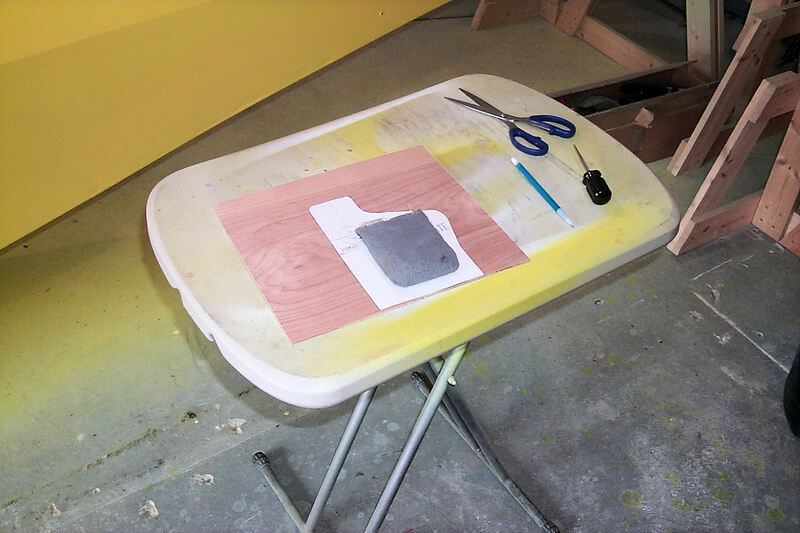 In this photo I've cut out the template for the cutouts on the inboard side of each pant. 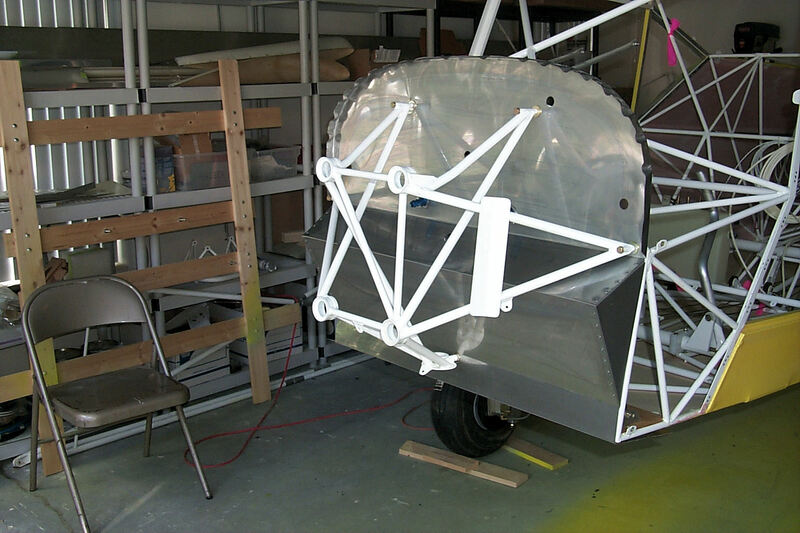 You can see that I've aligned it over scrap plywood and used a shot-bag scuba weight to hold it in position while I draw around it. The finished pattern. Look closely and you can see the alignment hole. Spotting the holes. I butted each pant against a wall and leveled it to spot the horizontal distance from the nose. To spot the vertical distance I measured from the mold line. I spotted and drilled holes on both sides. 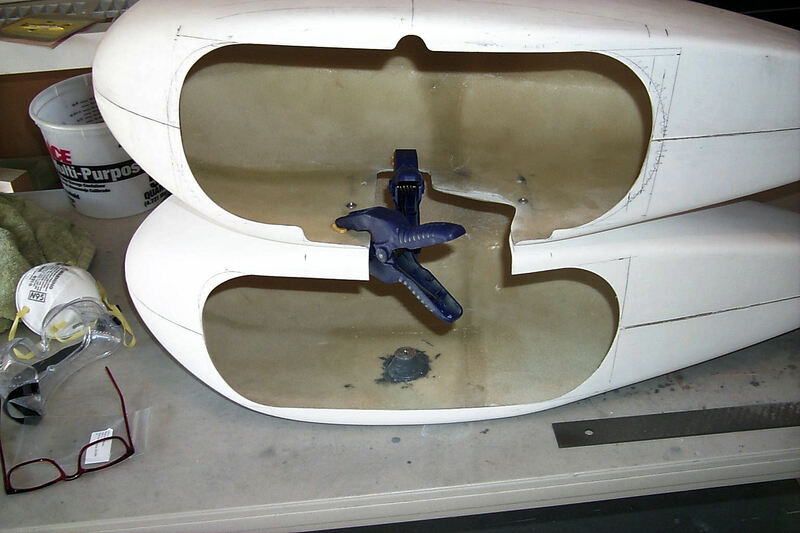 The outboard hole will be used to attach the pant to the axle. 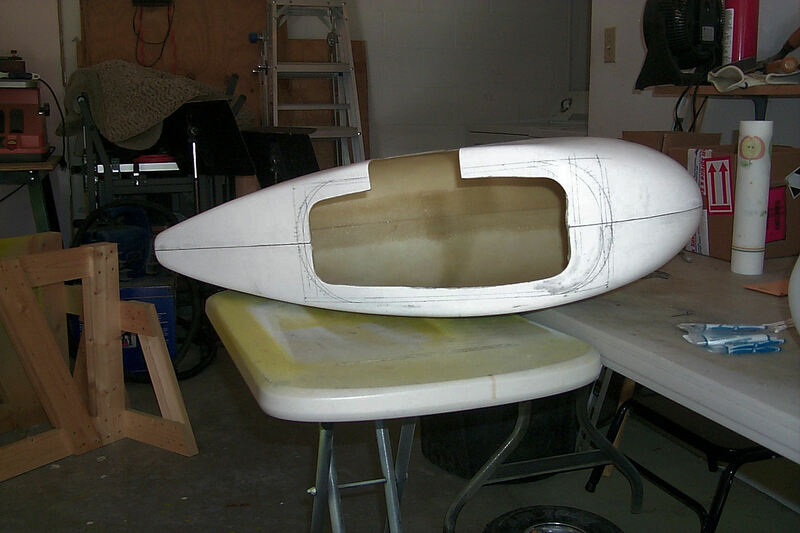 The inboard hole will help align the pattern in order to draw the shape of the cutout. 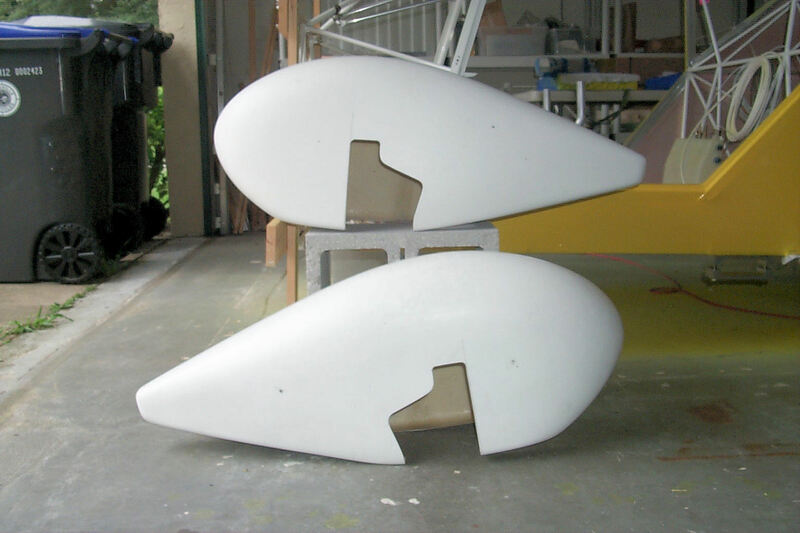 I was very careful not to make two left or two right wheel pants. I'm fully capable of making that kind of mistake. 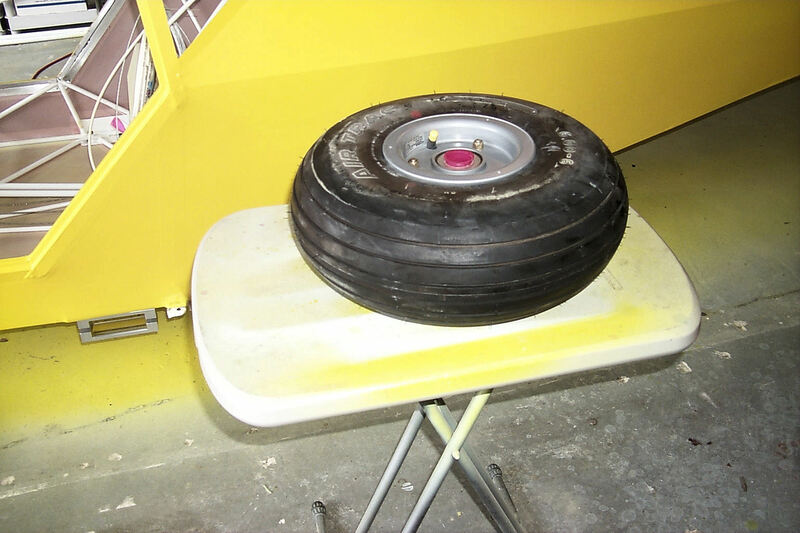 27 July 2013: Nose wheel pant. The new style pant from Kitfox comes with scribe lines showing where to drill and trim. 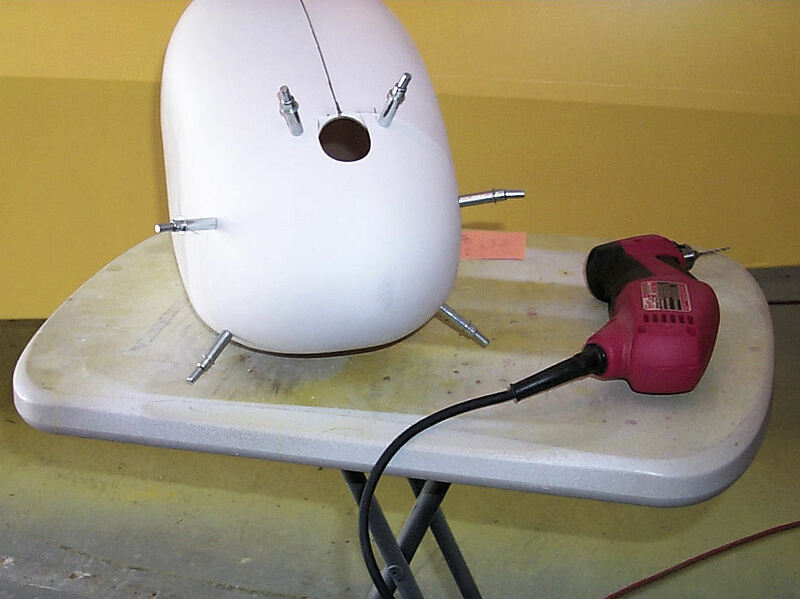 I first verified that the holes matched the mounting points on the nose wheel fork and drilled away. 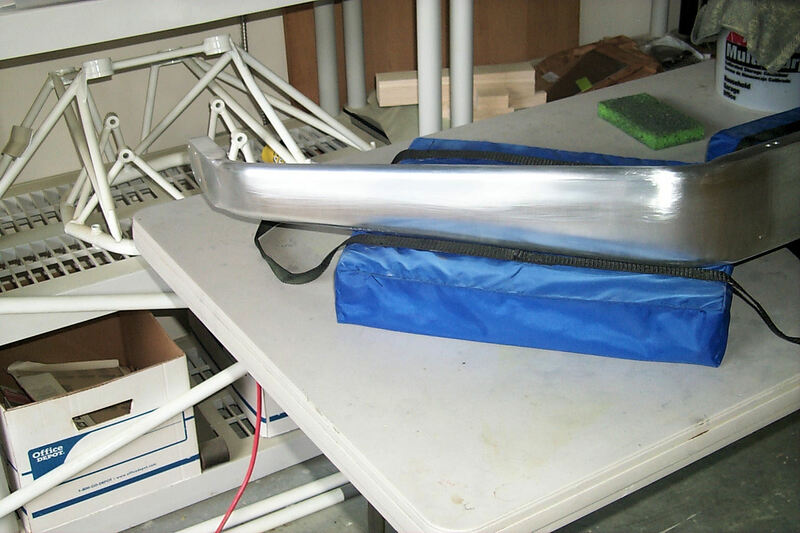 28 July 2013: Nose wheel fork. The standoffs are in place. I had to file the axle standoffs before they fit. It took quite a while since I was being careful not to remove too much. 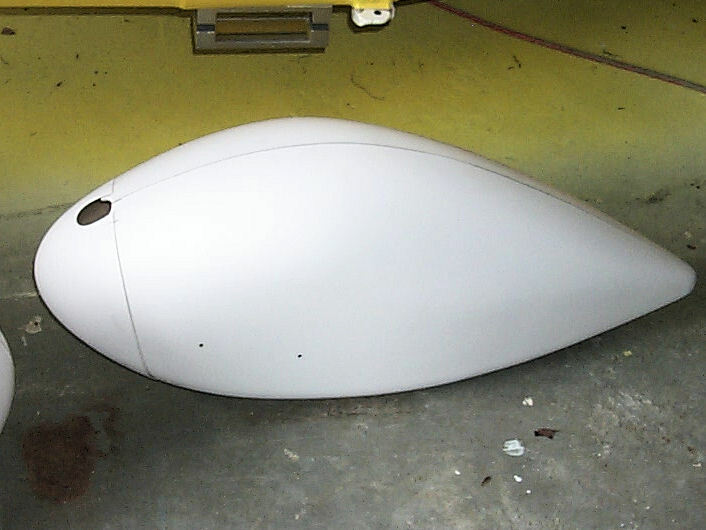 29 July 2013: Mounting the nose cover. Pretty straight forward. 1 August 2013: It's on its legs. My brother and a friend helped me and we were so busy I wasn't able to take pictures. 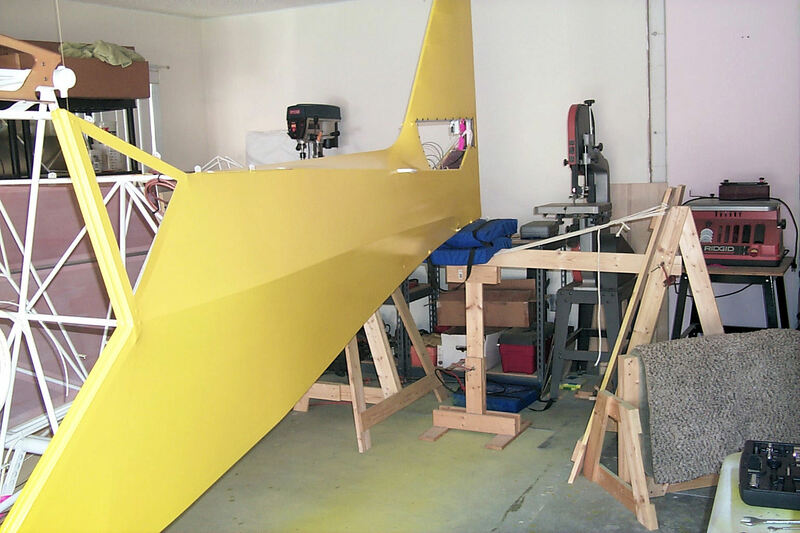 Basically we lifted the fuselage and placed it on the concrete blocks and a tail stand. 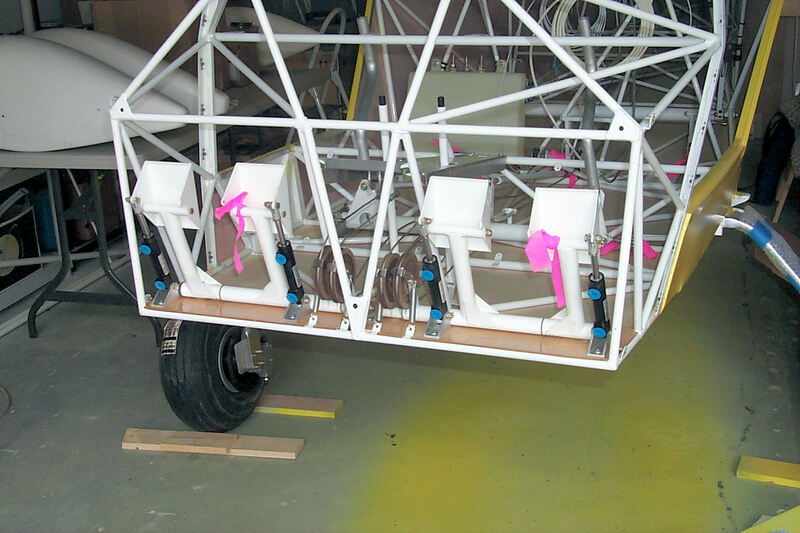 We then placed the gear on the horses and worked it under the fuselage until it aligned with the upper clamps. With a little bad language we were able to install the lower clamps and bolt it all together. 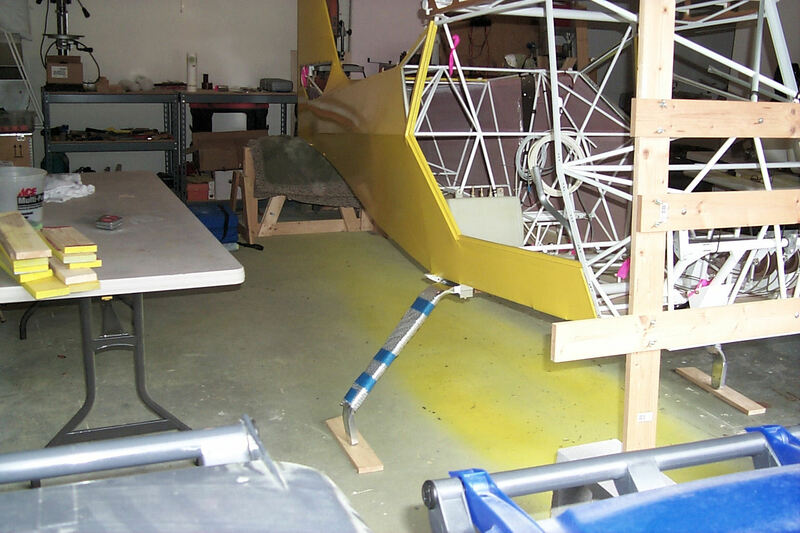 Post Script: As one who prides himself with building jigs and fixtures I'm embarrassed to say that my tail stand proved to be inadequate. It failed us and we almost had a disaster. This is the reason the photos show the tail supported by one of the horses. 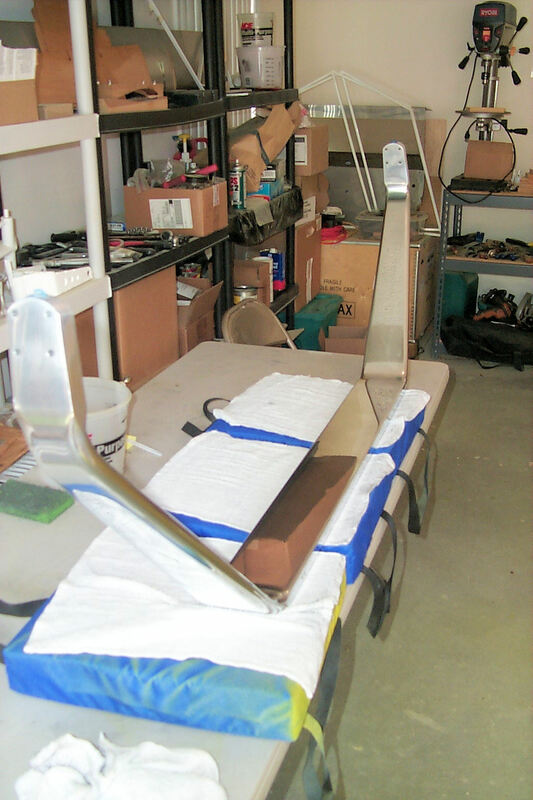 Tomorrow I will build a better tail stand. 5 August 2013: I know! A little overdone. After last weeks scare I wanted to make sure the tail was well supported. 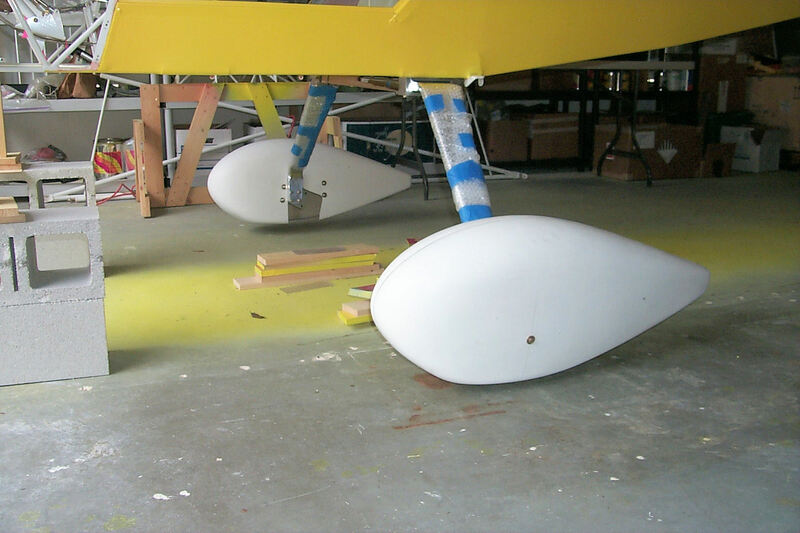 6 August 2013: I'm fitting the main wheel pants. 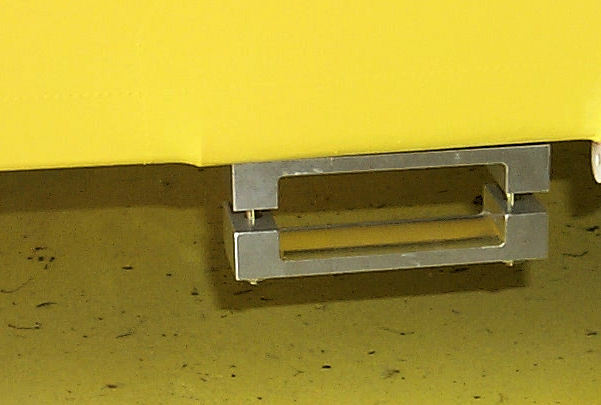 While the pants were bolted in place I used spots of epoxy to "tack" the spacers in place. This assured correct alignment. Once the epoxy cured I added a somewhat substantial fillet of more epoxy. 9 August 2013: An entire day spent scratching my head. I think I finally have it but I'm going to sleep on it before I begin cutting. 11 August 2013: I spent yesterday and part of today getting this right. You can see where I had to make cutouts around the brake caliper. Part of the reason for my slow progress is the Florida Heat. I have to take frequent breaks to avoid heat exhaustion. I precisely align the two pants with screws and mark the additional cutouts. I crossed my fingers in hopes that this would work. It did and the second pant took less than an hour to complete. For a while I'll be away from the kit. Its time for the Cessna's annual. It can take a couple of days or a couple of weeks. It all depends on what evil is lurking in the shadows. 23 August 2013: Back to work! 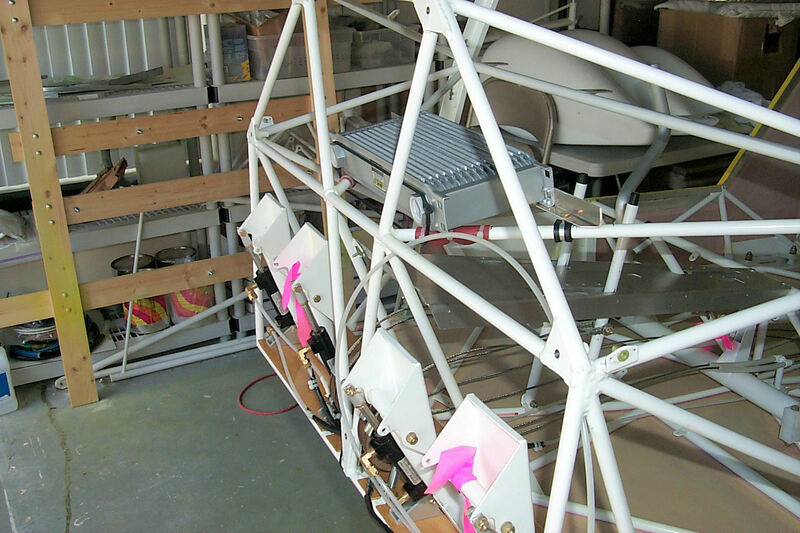 I've permanently bolted the rudder pedals in place and threaded the rudder cables through the fairleads. 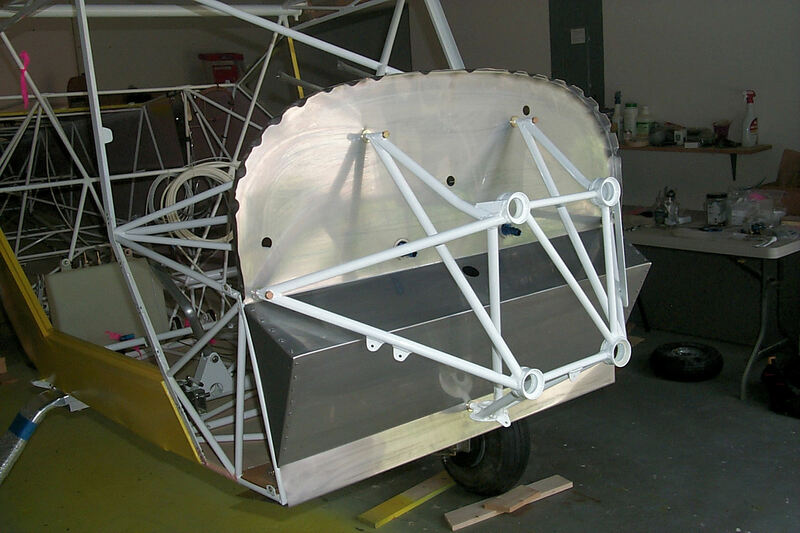 25 August 2013: Installing the brake lines. 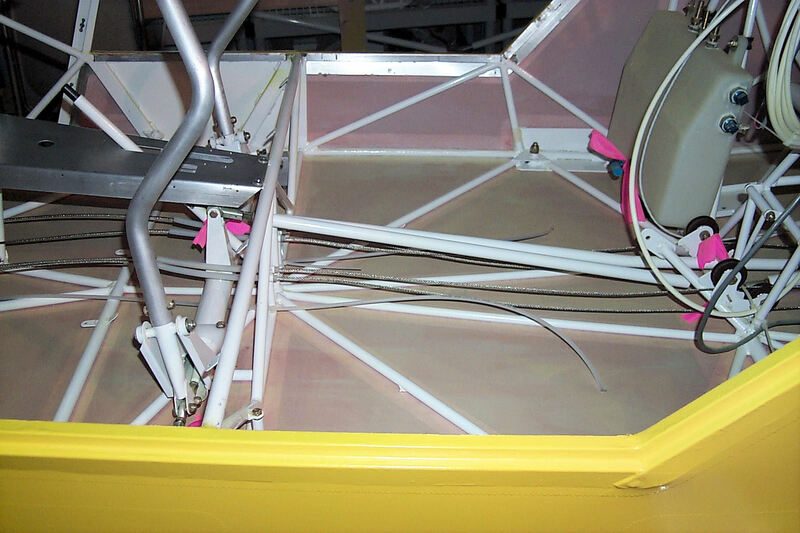 The loop extending from the pilot's pedals will lead to the fluid reservoir. You can see where I applied spiral wrap to places where the lines travel through a minefield of chafe points. I used clear plastic tubing to protect the lines leading to the calipers. 27 August 2013: The brake lines are complete. There are a few issues that have to be resolved. 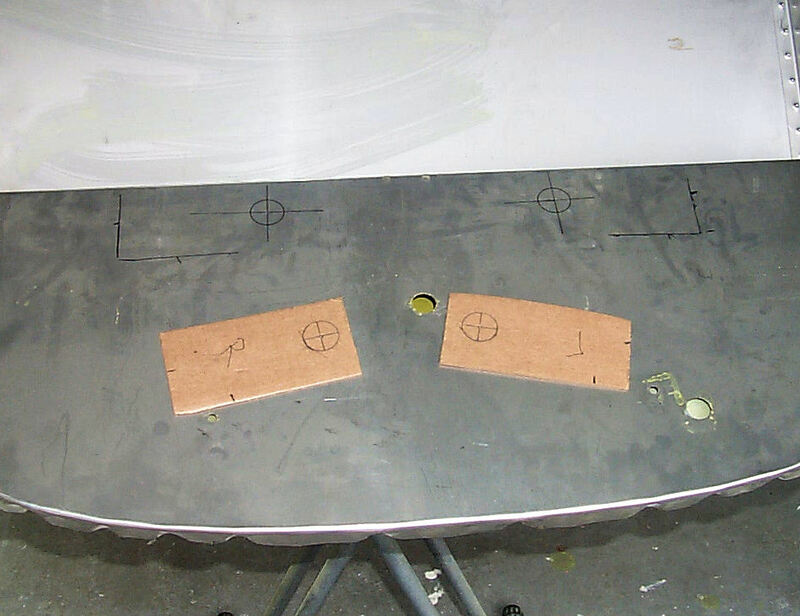 This will require completing the cables to the rudder and trial fitting the firewall. As you can see in the first photo I need to secure the lines. 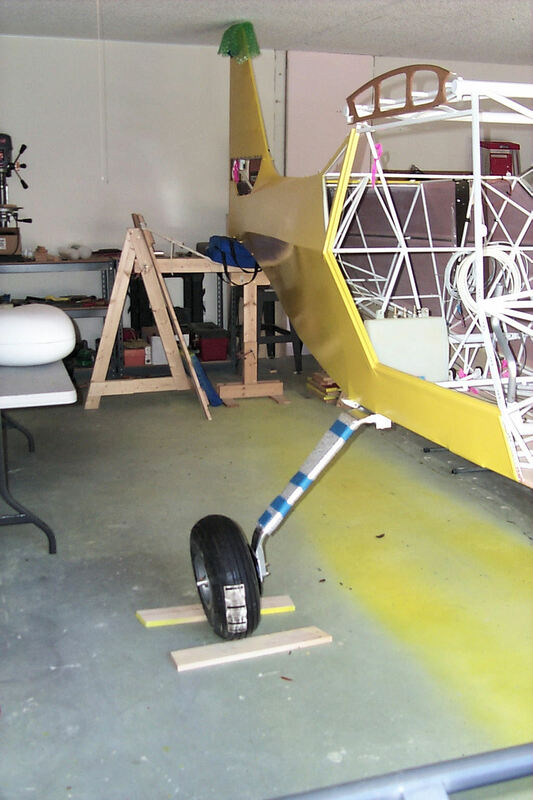 1 September 2013: So I'm installing the landing gear which, in order to complete, I must install the brake lines. But I have to resolve issues to finish the brake lines. 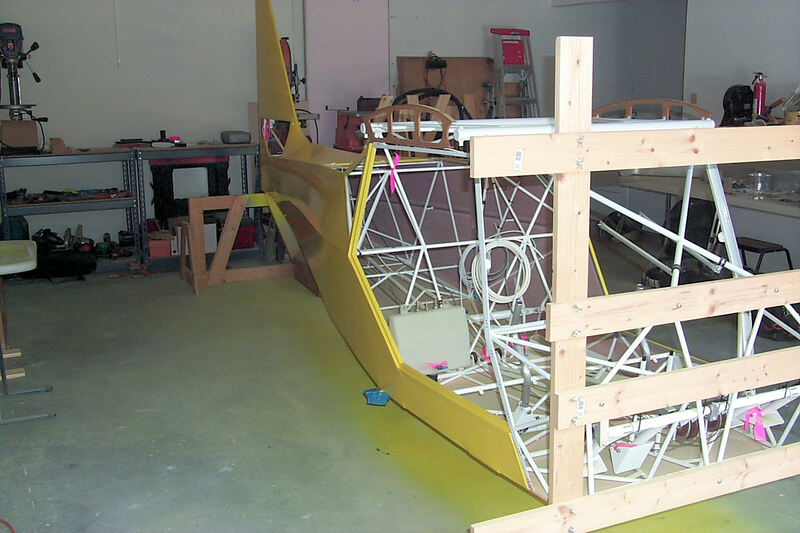 This means I have to mount the firewall and rig the rudder cables. 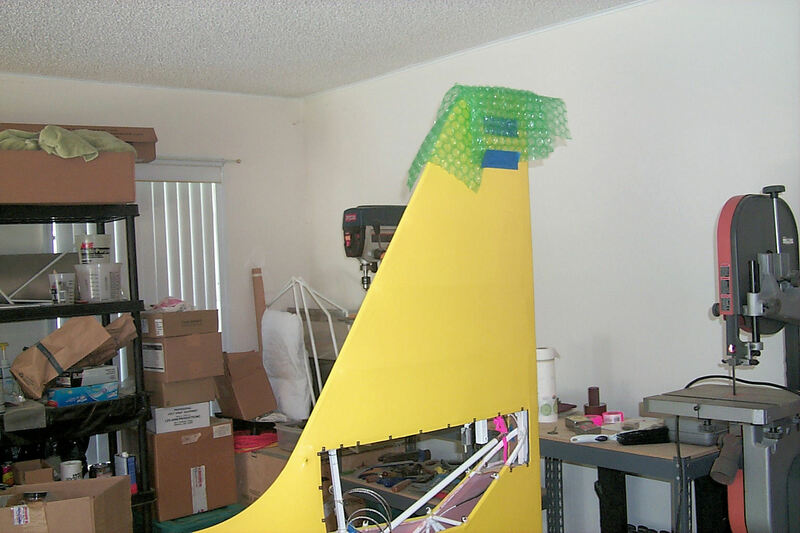 After that I can remove the firewall and make corrections. 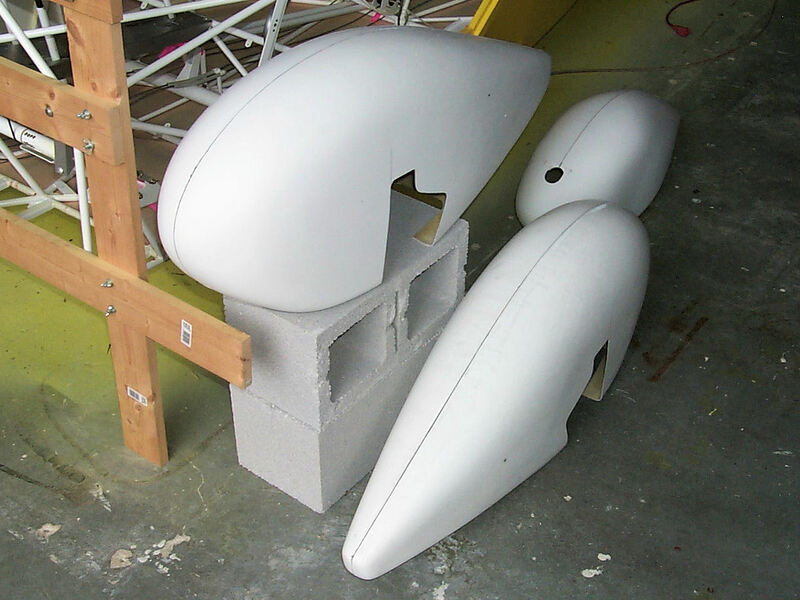 Then I'll be ready to permanently mount the firewall and engine mount which will allow me to mount the nose gear. But wait!! 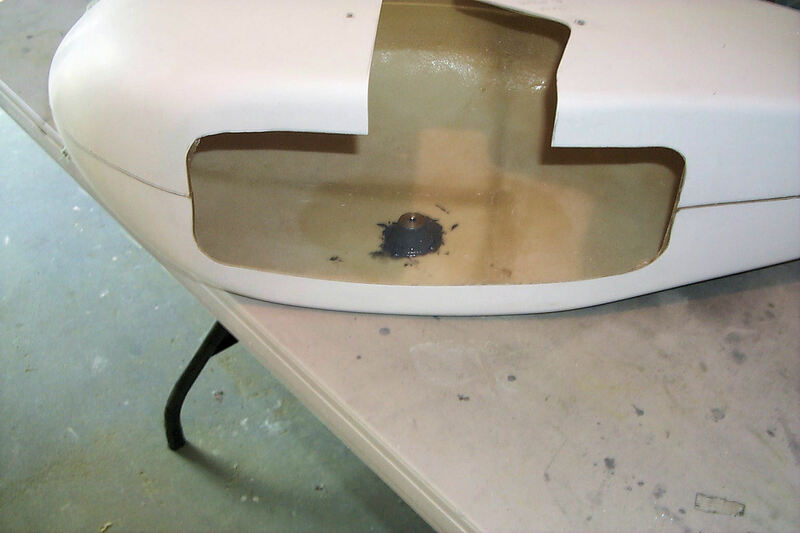 If the firewall is permanently in place it will be very difficult to cut holes for the cabin heater. That is why I spent the day working out the cabin heater installation. It seems that there is a great variation in heater cores between different kits. (I discovered this by looking at photos.) That's why what I doing has little relation to the instructions. I'm patting myself on the back for my ingenuity but, if it fails, I own it. 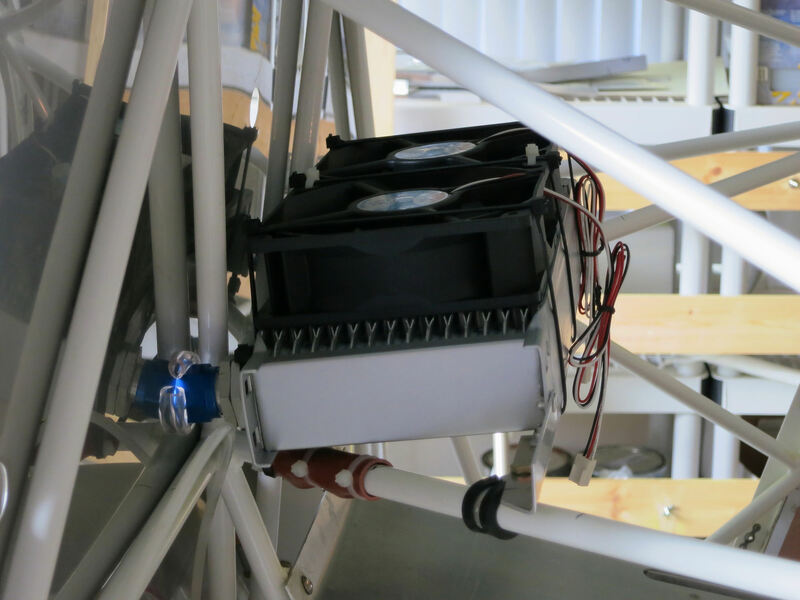 the photo shows the heater temporally in place. Why, you ask, do I need a cabin heater in Florida. On a brisk January day in Florida we wear shorts and a sweatshirt or light sweater. Then climb into the airplane and ascend to 8,500 ft. Where we freeze our nads off. 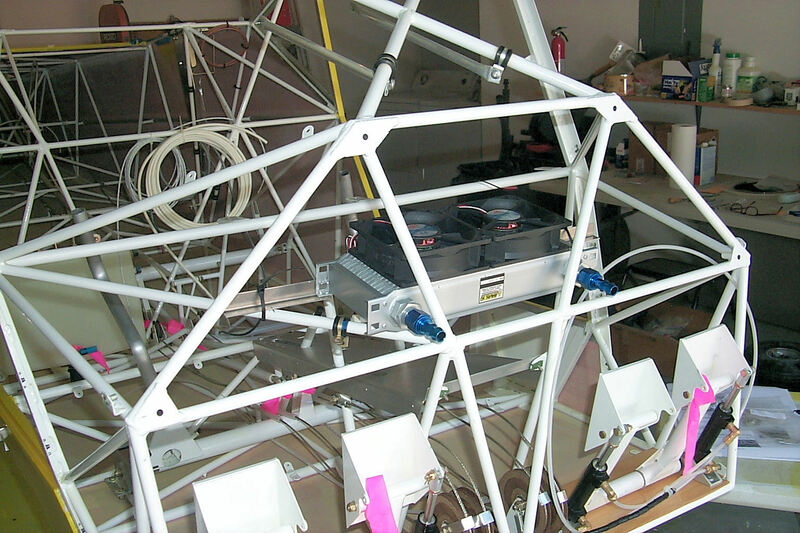 2 September 2013: The heater core is permanently mounted. 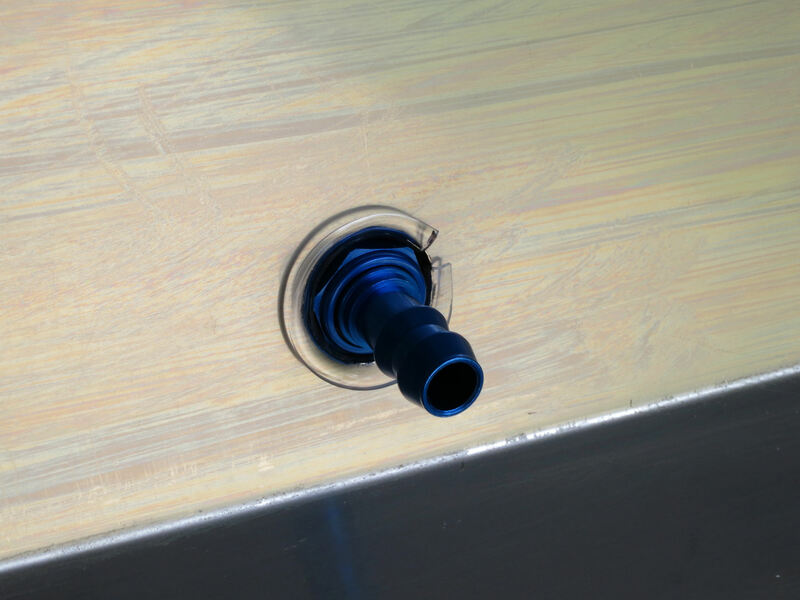 I then temporarily installed the firewall and spotted the holes for the coolant hoses. 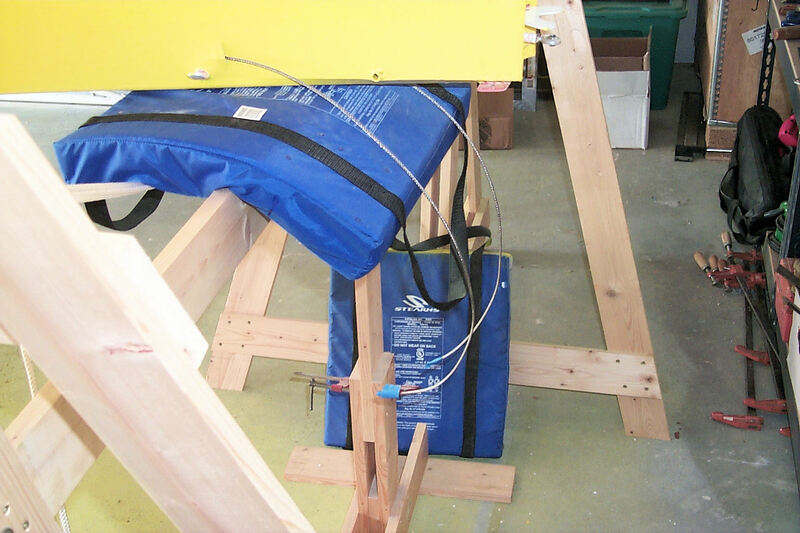 I discovered that I was able to resolve the brake line issues without rigging the rudder. 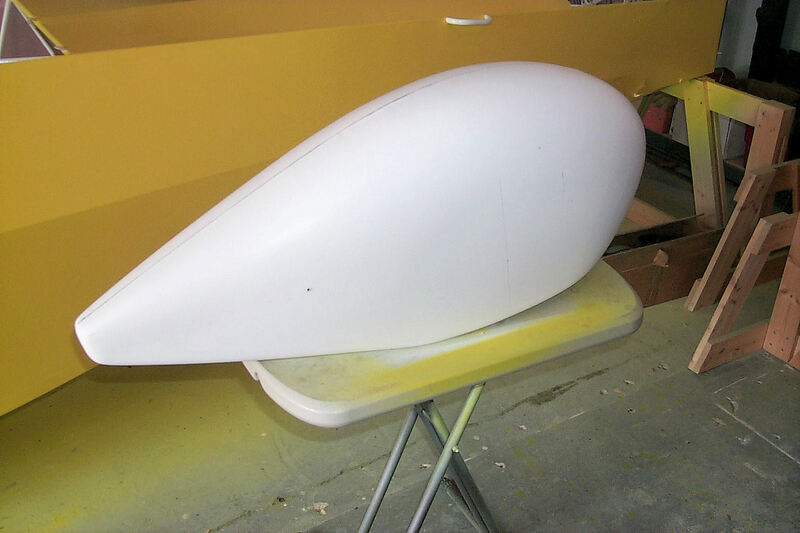 Because of that I will put off rigging the rudder until the firewall is permanently in place. My method of spotting the holes. Are they accurate? Wish me luck. 3 September 2013: Good enough! I've lined the holes with plastic tubing. I'm not sure if this will be the final configuration. 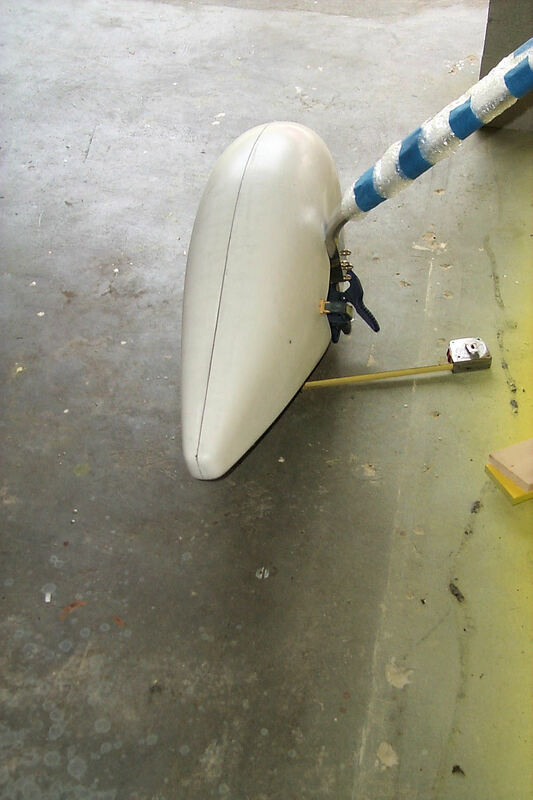 6 September 2013: Engine mount is in place! 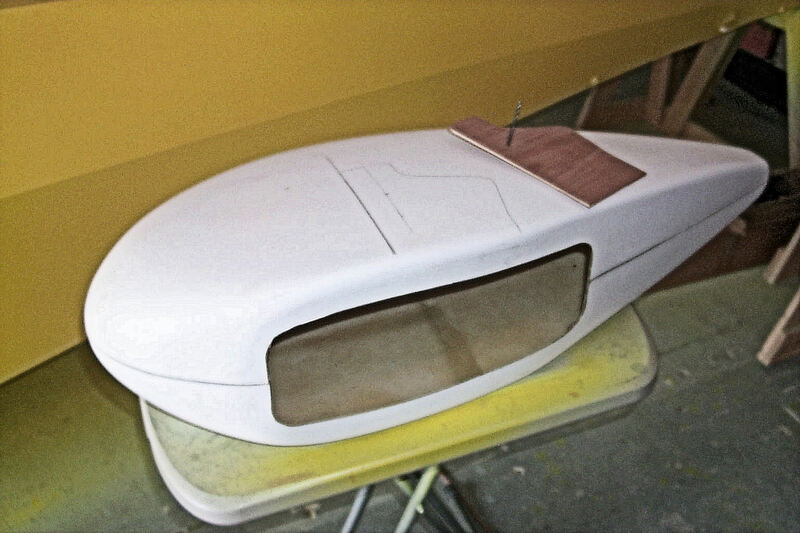 7 September 2013: Not much kit-building today but, I did manage to install the fuel hose bulkhead fitting. I promise I'll remove the "red stuff" graffiti. 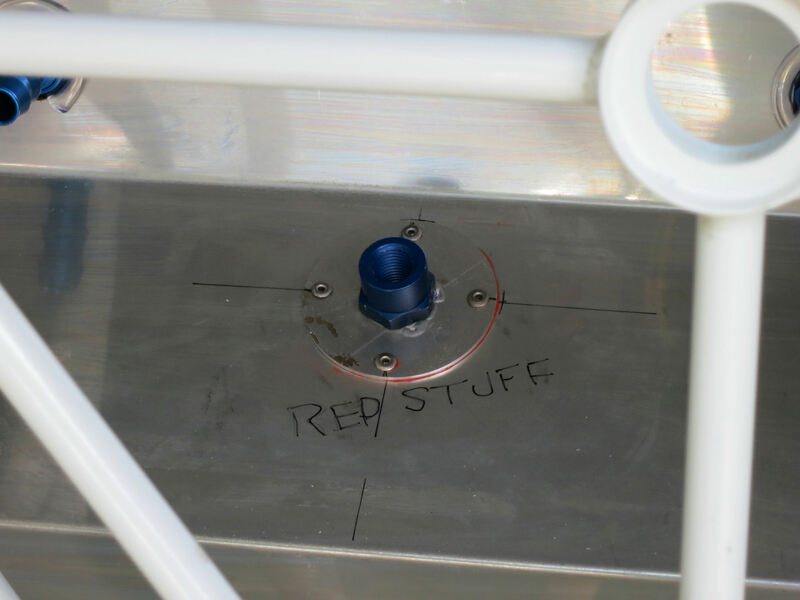 I put it there to remind me to bed the fitting with high temperature RTV.